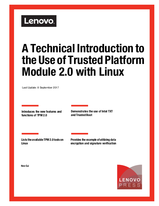 The Trusted Platform Module (TPM) is a cryptographic component of many Lenovo® servers that provides additional security features. The TPM is an integral part of hardware-based security in Lenovo servers related to tasks such as user authentication, remote access, and data protection. System function such as Intel Trusted Execution Technology (Intel TXT) make use of TPM enhancements to help ensure system security. This document covers a brief introduction to TPM 2.0 technology. It provides step-by-step instructions on how to enable TPM 2.0 on Lenovo servers running Linux. The document assumes the reader is already familiar with TPM 1.2 and the administration of Linux systems.